Data in Siemens S7 PLCs is stored different locations depending on the intended use of the data. For example there are separate locations for Inputs, Outputs, Data Blocks and so on. V Memory Vnnnn V is an alias for Data Block 1. DBbb,nnnn bb is the data block number. Either a comma (,) or period (.) 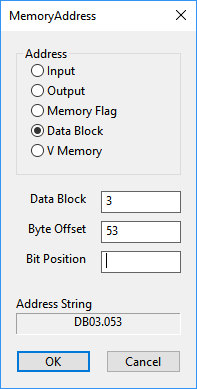 can be used between the data block number and offset. Note: The numbers in Siemens S7 PLC Data Addresses are zero-based. I0 The first byte of inputs. Q124 Output byte 124. The first output of the integrated I/O of an S7-300 PLC with built-in I/O, for example the CPU313C. V100 In S7-300/400 PLCs byte 100 in Data Block 1. DB01.0 In S7-300/400 PLCs the first byte in Data Block 1. In S7-200 PLCs the first byte of V Memory. In the IOItemName field of an Analog IO Data Tag when the tag is associated with a Siemens S7 PLC. In the IOItemName field of a Digital IO Data Tag when the tag is associated with a Siemens S7 PLC. In the IOItemName field of a Double Word IO Data Tag when the tag is associated with a Siemens S7 PLC. In the IOItemName field of a String IO Data Tag when the tag is associated with a Siemens S7 PLC. In the IOItemName field of a Word IO Data Tag when the tag is associated with a Siemens S7 PLC. In the MemoryAddress field of a Siemens S7 Memory Block. In the DataAddress parameter of the DirectWriteBit tag command when used with a Siemens S7 PLC. In the DataAddress parameter of the DirectWriteByte tag command when used with a Siemens S7 PLC. The Data Address Editor provides a convenient tool to build Siemens S7 Data Address strings. To learn about Siemens S7 Memory Block Tags. For an overview of the Siemens S7 Driver. For the meaning of terms used in Fernhill SCADA. Fernhill SCADA Version 3.36. Copyright © 2012-2019 Fernhill Software Ltd: All rights reserved.